The Congress president accused the BJP of celebrating a ‘hollow defeat’. 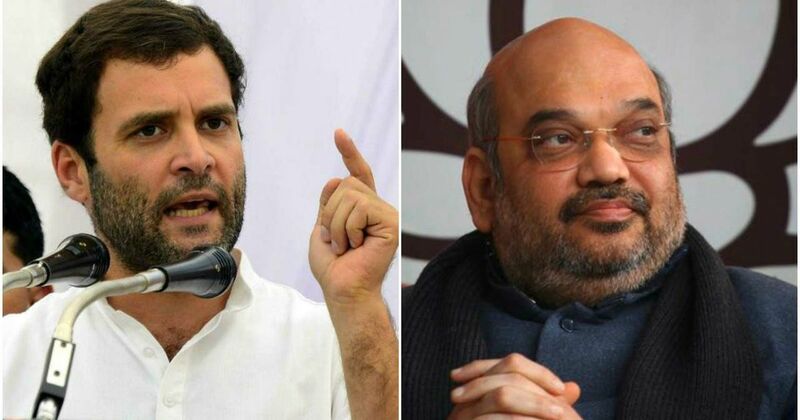 Congress President Rahul Gandhi and Bharatiya Janata Party President Amit Shah on Thursday criticised each other over the outcome of the hung Assembly in Karnataka and attempts by their outfits to stake claim to form the government. This came on a day Bharatiya Janata Party leader BS Yeddyurappa took oath as Karnataka chief minister. The swearing-in was held hours after the Supreme Court refused a petition seeking to stay the ceremony. The Congress and the Janata Dal (Secular) had moved the Supreme Court registrar on Wednesday night after Karnataka Governor Vajubhai Vala invited the BJP to form the government. Vala has granted Yeddyurappa 15 days to prove his majority on the floor of the house. The Supreme Court said the matter would be taken up next on Friday morning. Gandhi accused the Rashtriya Swayamsevak Sangh of capturing the independent institutions of the country, The Times of India reported. “This morning, while the BJP celebrates its hollow victory, India will mourn the defeat of democracy,” Gandhi tweeted. The BJP president said his counterpart did not “remember the glorious history of his [Gandhi’s] party”. “The legacy of Rahul Gandhi’s party is the horrific Emergency, blatant misuse of Article 356, subverting the courts, media and civil society,” Shah tweeted. Who has the people’s mandate in Karnataka? The BJP, which has won 104 seats. Congress which dropped to 78 seats, whose own CM and Ministers lost by big margins. JD(S) who won only 37 seats and lost their deposits on several others. People are wise to realise. The ‘Murder of Democracy’ happens the minute a desperate Congress made an ‘opportunist’ offer to the JD(S), not for Karnataka’s welfare but for their petty political gains. Shameful!